Remember the days when air travel was exciting and glamorous? Or perhaps you think the whole comic book conference scene has become too mainstream and overrun with poseurs. Or maybe you happen to be: a) in the San Francisco area this weekend, and b) an airline history geek, or c) curious about the fact that there actually is such a thing as an airline collectibles subculture. If any of the above apply, then you won't want to miss the 6th Semi-Annual SFO Airline Memorabilia Show, which will take place on Saturday, March 10, 2007 at the Best Western Grosvenor Airport Inn near San Francisco International Airport. Admission is $5, and doors open at 9:30. Tableholders are coming from as far away as Honolulu and the east coast ! We'll have a room full of dealers with even more interesting items to add to your collections ! Thanks to all of your support, our local show has continued to attract more dealers and attendees than each of the previous shows ! Our SFO show is the third largest in the country. Telstar Logistics has attended this show several times in the past, and while it's compact in size, the selection is ample. 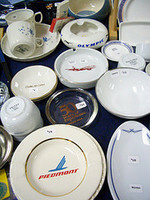 Vendors tend to specialize in: aircraft display models (as seen above), seatback safety instruction cards, cabin glassware and flatware, first- and business-class amenity kits, paper ephemera, airline playing cards, vintage giveaway flight bags, vintage airline advertisements, air sickness bags, and cabin uniforms. But if you happen to see any baggage-handler jackets, stand clear or be prepared to duel -- those will be OURS. HINT: Arrive early for the best selection, and we'll see you there. Can't make it to San Francisco? 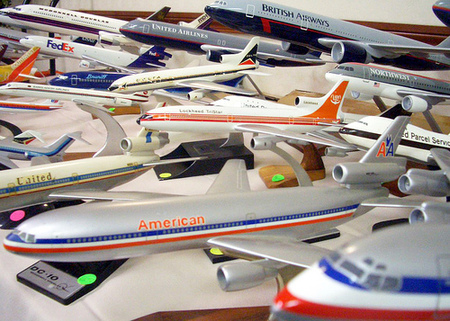 Airline collectibles shows also take place in Kansas City, Los Angeles, Seattle, Vancouver. Thank you for the heads-up! I went this morning, but was a little depressed as I wasn't able to find anything really worth bringing home (I'm not an airlines enthusiast but I love golden age airline design). Was this a typical show, or did this one have a poor showing in general? I'm willing to give it another shot later unless today's was typical. Hi Joshy! This one was sort of typical, but I noticed there was a lot less glassware and barware than at previous shows. What kind of stuff, specifically, were you looking for? ..or visit Aviation Heritage Collectibles in Colorado Springs..